I was having lunch today with a good friend, and, as usual, after we were done she pulled out a couple decks. I suggested we swap readings, which we did. I had hardly gotten through two of the cards in the spread I was reading for her, though, before she stopped me and asked me to repeat something–I had mentioned a technique she had never heard of and she wanted more info. I explained and then proceeded with her reading, but she was already pulling out another deck and sorting the cards to work with this new technique! It seems like that’s what happens when I read for other readers–they usually get much more excited by the techniques they observe in my reading style than the substance of the reading itself! The technique I used in her reading is something I call “Backwards and Forwards.” I observed that the Wands and Swords suits move backwards through the numbers–the 10 is the beginning of the suit and the suit process ends at 1. The Cups and Pentacles suits move forwards, starting with 1 and moving towards 10. I discovered this through a combination of my meditative work with the cards, and specifically through my ongoing work with the kabbalistic Tetragrammaton and the permutation of the Divine Name, as well as through practical experience. I noticed that when we get the 10 of Wands or 10 of Swords in a reading, often one of the most positive things we say is that the cycle is over, and that’s something to be thankful for. But something about that never quite felt right–the 10 of Wands does not seem to lead to the Ace of Cups, as it would if the cycle were over and the next cycle beginning, based on placing the pips in numerical and suit order (Ace through 10; Wands, Cups, Swords, Pentacles). But it does make sense for the 10 of Wands to lead to the 9: the sticks carried in the oppressive burden of the 10 can be used to create the protective wall of the 9, the strong boundaries of which guide the swift flying 8 to come to rest so that the valor of the 7 can be realized, and so on, using the traditional RWS imagery. Using this technique, the good news in a reading when the 10 of Wands or 10 of Swords comes up is not so much that the querent is at the end of a cycle, but that although the querent may be in an uncomfortable place, we have a set of instructions for how to start from this place and take realistic, practical steps towards the ultimate goal of the suit. As we work down through the Wands, finding the stability of the four, stepping through what I consider to be the open door of the three, finding the sovereignty of the two, and coming to rest at the generative spark of the Ace, we can now naturally find a receptive container for that spark in the Ace of Cups, and having learned dominion of ourselves, can begin working successfully in collaboration with another, and so on through the emotional and relationship-oriented suit of Cups. The suits of Wands and Swords, both active, masculine suits, have a sense of movement to them. The 10 of Cups and 10 of Pentacles, the receptive, feminine suits, are comfortable places to rest; they do not call us to take action the way the Wands and Swords do. However, if one were to stay too long in the success of the 10 of Cups; if perhaps it were reversed and one started feeling indulgent with it, then certainly it’s possible that the depression of the 10 of Swords would result, moving us into our next suit, which we would then work through in reverse order. The Ace of Swords and Ace of Pentacles match nicely too, whether you view them as sword and shield, or if you see in that pairing the flaming sword that turns before the gate to the Garden of Eden shown in the Ace of Pentacles. In many ways, it makes a great deal of story-telling sense to count down the suits of Wands, up the suit of Cups, down the suit of Swords, then up the suit of Pentacles, moving backwards and forwards through the pips. 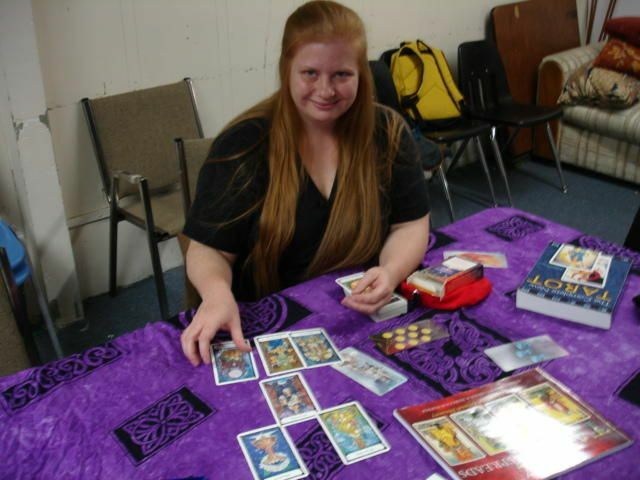 Joy Vernon is a Certified Professional Tarot Reader in Denver, Colorado. To schedule an appointment, please visit JoyVernon.com.